Welcome to The Abso!ute Sound online! We explore music and the reproduction of music in the home. We believe that the sound of music, unamplified, occurring in a real space is a philosophic absolute against which we may judge the performance of devices designed to reproduce music. Our goal is to provide the resources consumers need to judge how a component's sound either honors or departs from the music's truth, and to make sound purchasing decisions that maximize their experience of reproduced sound. Below is our Issue 148, June / July 2004 table of contents and editorial. Our column on affordable gear resumes with new writer Jerry Sommers. cartridge, and sets it all atop Townshend's Seismic Sink Isolation Platform. Robert Harley argues that, for all the great contributions the high end has made over the years, it also has a habit of ignoring opportunities to expand its business (and your options). Andrew Quint kicks off the first in a new series on must-own music. gorgeous, so says our man, Jonathan Valin. In a series of special reports in The Cutting Edge, we explore the past, present, and potential future of high-end multichannel sound. In his Multichannel Audio Primer, Robert Harley explains the ins and outs of expanding your two-channel system — the right way; the TAS Roundtable finds RH, HP, Classical Music Editor Andy Quint, and recording engineer Peter McGrath debating the pros and cons of stereo, multichannel, center-channel speakers, and subwoofers; and in his Workshop, HP looks at the Dark Side of Multichannel Sound. Our staff selects the crème de la crème in affordable and mid-priced speakers. 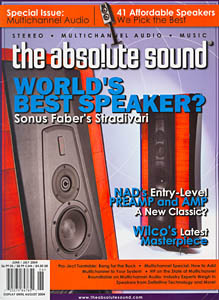 Chris Martens reports on NAD’s new entry-level separates. The latest combo amp from YBA finds Neil Gader waxing nostalgic. Neil Gader listens to a stacked pair of speakers with more than a few sonic and design twists. Wayne Garcia on VAC's top-of-the-line, retro-looking, all-tube integrated amp.